And this time, everyone's a winner. 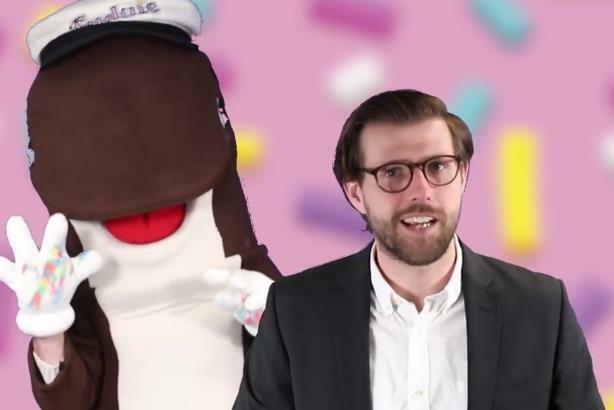 Carvel parodied live quiz app HQ Trivia with a series of videos featuring a bearded and bespectacled "Scott Rockyroadsky" quizzing fans, aka "Carvel Cuties," on Twitter. Rockyroadsky is, of course, not HQ’s real host. That’s Scott Rogowsky, who calls his own fans "HQties" (pronounced "H-cuties"). The ice cream brand picked Thursday to host its own Carvel HQ in celebration of National Trivia Day. Since Vine cofounders Rus Yusupov and Colin Kroll launched HQ last fall, the trivia app’s audience has rocketed to more than 500,000 players per game. "HQ’s audience grows so big every week, we thought we need to jump on this before someone else steals the thunder," said Matthew Courtoy, Carvel’s senior social media manager, noting that his team is "obsessed" with the app. Courtoy said the idea came about last month and was executed by Carvel’s internal team. The toughest part, he said, was figuring out how to mimic HQ’s gameplay aspect on Twitter. Carvel was able to intersperse videos with Twitter polls because the social media site revised its thread functionality last month, allowing users to more easily post tweetstorms, or connected tweets. Question 1: What day of the week do you get Buy One, Get One sundaes at Carvel? "We were able to make it feel like you’re doing the game in another medium with the Twitter thread feature," said Courtoy. "If we hadn’t cracked that, we may not have done it." The next challenge was finding a Rogowsky lookalike. Fortunately, Courtoy didn’t have to look beyond the third floor of his office. "The host is our user experience guy; he has a passing appearance for [Rogowsky]," he said. "Oddly enough, he had never seen HQ before. For someone who had never seen the host delivery style and tone, he kind of nailed it." Carvel posted 10 videos and nine poll questions on Twitter. Instead of awarding a grand prize of $1,000 to $18,000 like the real game does, Carvel posted a link to a Sundae Dasher coupon that anyone could use, even the losers. "We shot a video intro for each question and then a video revealing the answer and setting up the next question, not unlike the game on the app," Courtoy said. Carvel’s videos have garnered 2,000 views, and more than 1,000 people played through to the end of the game, said Courtoy. HQ has not commented on Carvel’s parody. However, it sounds like this isn’t the last we’ve seen of Rockyroadsky, so the "Quiz Daddy" should keep an eye on his new competition. "We think we might have something we can turn into a recurring feature," Courtoy said. "We wanted to start small to see how it works and how our audience responded to it."